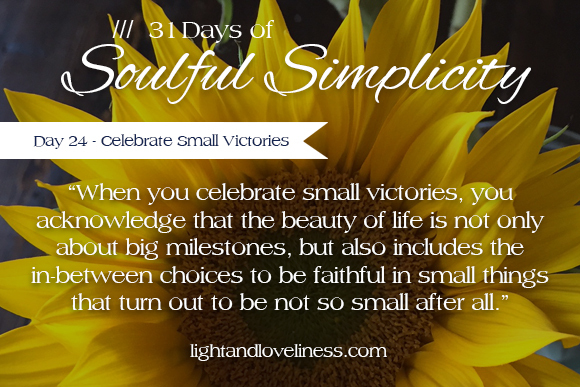 This is day 28 of Soulful Simplicity, a 31-day series through the month of October. The series can be found here, and I hope you find it enriching and encouraging. If you have any questions or would otherwise like to connect, feel free to send me a note: lightandloveliness [at] gmail [dot] com. Faithfulness is the natural result of a soulfully-simplified life. If I want to be a faithful person, I begin by simplifying my heart and home. I see my purpose, and I know my priorities. I faithfully attend the tasks required to tend them, even if those same tasks require much from me. My life is not complicated by unnecessary commitments, or overburdened by excess things. I don’t take my cues from social media and I don’t have to prove myself ‘enough’, but instead show myself capable, willing, and faithful in the small things. I can focus on what I’m actually responsible for and get rid of the rest. I do not exhaust myself for pursuits that don’t make the list of my highest priorities, and I don’t find myself weary at the end of the day for no good reason. I am not easily blown off course because the ties that would tug on me from this way or that have no hold here. For you who long for this kind of peace, this kind of wellness within your soul, this kind of order within your home, I encourage you to be still, quiet your heart, and seek God. Ask Him for help. Ask Him for His peace, His wholeness, and His love to sink in to the deepest places. Pursue simplicity, one step at a time, and see if you do not discover the upside-down, beautiful, humble road to success in your pursuits. This is day 27 of Soulful Simplicity, a 31-day series through the month of October. The series can be found here, and I hope you find it enriching and encouraging. If you have any questions or would otherwise like to connect, feel free to send me a note: lightandloveliness [at] gmail [dot] com. It only takes a few minutes on social media before you feel a pang. You see women who are fit, beautiful, and bold. You see their flawless homes and their cherub children, their incredible vacations, and you immediately feel insecure, inadequate, and unable to keep hold of contentment for yourself. You may begin feeling sorry for yourself, or you might find something about those to whom you are comparing and become hyper-critical of them. It always swings one way or the other. Comparison brings about discontentment, opens the door negativity, and makes the one who is comparing overvalue or undervalue themselves in the form of either pride or insecurity. Simplicity is a quiet, but effective war against comparison. It is a philosophy that sits in direct opposition to evaluating ourselves, our homes, and our bodies against an ever-changing standard of what is desirable. It is a shortcut to contentment because it slices through the incoming messages that we are not or cannot be enough. With simplicity, I discern what the highest priorities are in my life and I take action to protect them. I have my purpose in mind, and my life intentionally well-ordered, and I am no longer trying to hit the moving target of competition because my target is defined by me and is not dependent on what anyone else has or does. Simplicity is a short-cut to contentment because if I am a champion of simplicity, I grow to value my core priorities higher than anything else. Simplicity allows me rest from striving to meet outside standards and instead invest my energy into establishing a life that is reflective of what is desirable and lovely…to me. Simplicity liberates me from the ties of insecurity because comparison is rooted more in the appearance of wellness, adequacy, and beauty than the reality of them. Simplicity allows me to methodically pursue wholeness and become truly well, recognize my beauty, and see that when I am free from the standards that would be applied from a place of comparison, that my simple life is not only adequate, but desirable and full of value if I have eyes to see it. Simplicity is a bold choice to shut out influences that sow discontent in my life. By choosing my influences wisely, I can keep comparison from taking my joy, confidence, and contentment. 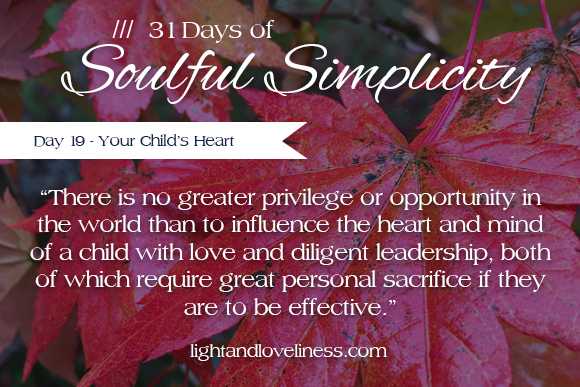 This is day 26 of Soulful Simplicity, a 31-day series through the month of October. The series can be found here, and I hope you find it enriching and encouraging. If you have any questions or would otherwise like to connect, feel free to send me a note: lightandloveliness [at] gmail [dot] com. Stewardship is the responsible management of something entrusted to us. Many people automatically think of stewardship as where you put your financial resources, but stewardship is applicable to many other areas of our lives. We can steward money, time, energy, belongings, and opportunities. We can also steward our households, our relationships, and our own well-being. Stewardship refers to how we utilize every resource we have—toward fruitfulness or toward wastefulness—based on the intentions we have and the actions we take. We can steward all of the above things well, or we can steward them poorly. I find that when I’ve stewarded something well, I am glad to own it and pat myself on the back, but if I’ve done a less than stellar job, I am likely to blame it on something or someone else. It is unfortunate, because even when we make mistakes, we have the opportunity to steward our mistakes well, if we own our choices and learn from them. Stewardship requires that we keep a focus on ultimate purpose and long-term vision so we don’t squander what we’ve been given care of in the present. We have a responsibility to use well what we have. We have freedom to do that how we see best, but as we make choices, we have to remember that shortcuts today often mean costs tomorrow. This goes for finances, raising children, marriage, working through problems, and how we spend our time. Resources come through us—not to us—which is a way of saying, we have the opportunity to multiply what we have been given, and to produce a return on our investment. For this reason, discernment and discipleship become important in the life of a christian because stewardship requires that we look to Jesus as a compass to discern what is worthy of our time, energy, and perseverance, and also for the strength and diligence we need to put our hands to what needs to be done, even if that means coming face-to-face with things we feel shame about or wish we could ignore. We don’t steward well by accident, but we can steward poorly without giving it a second thought. My prayer is that you will take a look at what stewardship looks like in your life, not because you need to ‘do better’ or ‘perform well’, but because you will ultimately gain more—more freedom, more fullness, more abundance—if you are doing well in these areas on purpose. 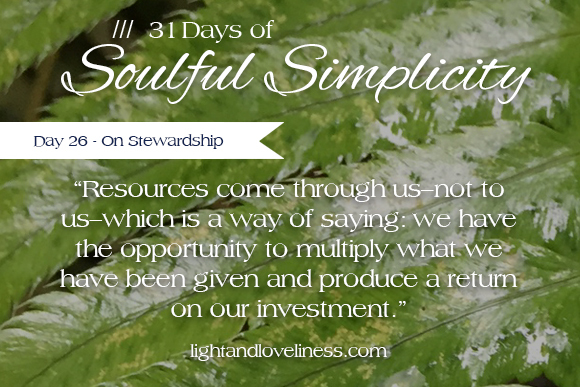 This is day 25 of Soulful Simplicity, a 31-day series through the month of October. The series can be found here, and I hope you find it enriching and encouraging. If you have any questions or would otherwise like to connect, feel free to send me a note: lightandloveliness [at] gmail [dot] com. Today, I have gathered 8 tips for creating a sustainable schedule. 1—Identify the underlying purpose behind what you commit to, and if something no longer serves it’s intended purpose, don’t be afraid to let it go. If you are asking yourself, “What is the point of this?” you will have a hard time following through on a commitment as soon as you have some resistance or challenges come up. If you have already identified the purpose of an event on your calendar, you can put your heart into preparing, getting there, and engaging in whatever it is. 2—Honor the rhythms and limitations of your family without apology. You know better than anyone else what things will and won’t work for your family. Sometimes other people will try to make you feel guilty or otherwise pressure you to add something to your schedule, but you do not have to explain why you choose not to commit to them. Make the best decisions you can and stand by them. 3—Be protective of your family’s top priorities. Maybe you love travel? Guard your budget and time off to be able to invest in that. Maybe you love making memories together? Schedule in your family adventures so they don’t get pushed out by urgent unimportant things. Maybe you value having dinner around the table together? Plan your meals ahead and get your kids in the kitchen with you to bring it together every night. Whatever your priorities may be, it is important to keep them in mind when making decisions about your calendar. 4—Keep in mind that your schedule should be serving you, and if it isn’t, make some changes. It is easy to feel like we are at the mercy of our schedules and that we have no choice but to do this or do that. We always have choices. That doesn’t mean they are easy choices, but there are ways to simplify, alter, and organize our lives to create a weekly rhythm that works for everyone in the household. 5—Simplify home and household systems so you can get through necessary tasks without wasting excess energy. There are many tasks that are necessary to keep a home together and moving forward, but that doesn’t mean that you should have to expend all the energy you have on those things. Look for ways to clear out what you don’t need and streamline tasks that you can’t get out of so they’re not so overwhelming when you get to them. 6—Develop a vision for your week ahead, or take a moment to plan just one day ahead. If you can see what is happening next, you can communicate with your family about what they might need to do to prepare. If you have a list of things that need to be tackled, you can stay focused and get those items knocked out. 7—Commit to things you can joyfully give your time to. It doesn’t mean that there won’t be things that are sometimes a stretch or a struggle, but you will be happier if you only commit to things you are excited about, or at minimum, able to show up with a willing heart to. 8—Keep an eye on margin and flexibility. Let’s face it. These two things are sustainable-schedule essentials. 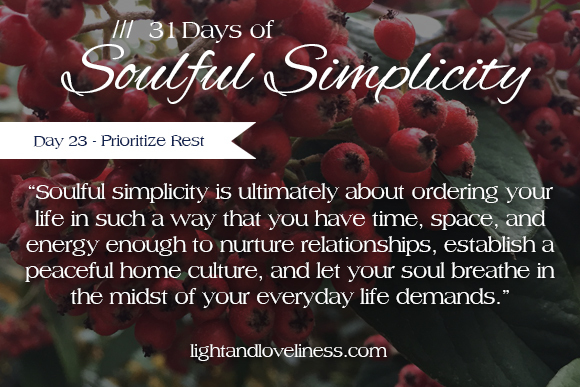 This is day 24 of Soulful Simplicity, a 31-day series through the month of October. The series can be found here, and I hope you find it enriching and encouraging. If you have any questions or would otherwise like to connect, feel free to send me a note: lightandloveliness [at] gmail [dot] com. It is easy to get caught in a cycle of looking ahead to what might be in the future, or looking behind and dwelling on everything that happened in the past, but never really owning the space we fill in the present. It is good to dream and cast vision for what is ahead, and it is good to reflect on experiences and lessons learned to process how we feel about them and how we have been shaped by them. It is also good to find joy in the small place of this present moment, which might feel ordinary and like nothing special. Let me tell you, today is special, and it holds unique opportunities for you. Maybe it’s not a terribly exciting day, and maybe you’re not doing terribly exciting things, but it is my guess that even if it’s just an ordinary day, you are pressing forward with all the courage you’ve got, attempting to do whatever is in front of you to the best of your ability. Maybe you are gaining ground, little by little, and while your accomplishments for the day may not be garnering public attention and praise, you are taking steps forward from where you are. You may be inching along, or you may be sprinting to the finish line of a goal, but in either case, today I want to ask you to celebrate your small victories. When you celebrate small victories, you acknowledge that the beauty of life is not only about big milestones, but also includes the in-between choices to be faithful in small things that turn out to be not so small after all. An abundant life comes about because of seemingly insignificant choices to be faithful in everyday, ordinary tasks. These choices are not insignificant. They are the very things that build memories, build character, build a family, and ultimately build our lives. We look back on the highlights of our lives and can easily forget about all the living we did between the milestones. The interesting part is that the choices we make between milestones make a far bigger impact on the way our lives unfold. The small choices you make matter. The choices you make to do the next right thing—to engage hurts and troubles, to invest in others, to connect, to create, and respond with love—build on each other and lead to bigger victories in life. I see it like adding dry beans to a scale. Each little bean seems rather insignificant on its own, but as you add one after another, at some point, the scales are going to tip and you are going to recognize the greater accomplishment of what you have produced with your daily efforts. Every step toward simplicity, toward wholeness, adds up. I’m comforted by this reality because there are so many days that are hard for one reason or another, but celebrating my small victories makes encouragement the force behind the momentum I have to continue forward. Whether you are gaining ground by inches or miles, the point is, you’re gaining ground. Celebrating the small victories of my children are the very things that shape their character. Sure, there have to be limits and boundaries and lessons, but children are most motivated to do what they believe will be valued and celebrated. For this reason, I give high praise for the times they display servant-heartedness toward others in our family because that makes them interested and willing to serve in the future, knowing that their contributions and attitudes really make a difference for everyone. I think the acknowledgment of small victories brings about affirmation that we are doing well. So often we want praise from others, but we can be encouraged in the quiet of our hearts by recognizing what we have accomplished in the small spaces of life and celebrating those efforts in our own ways. 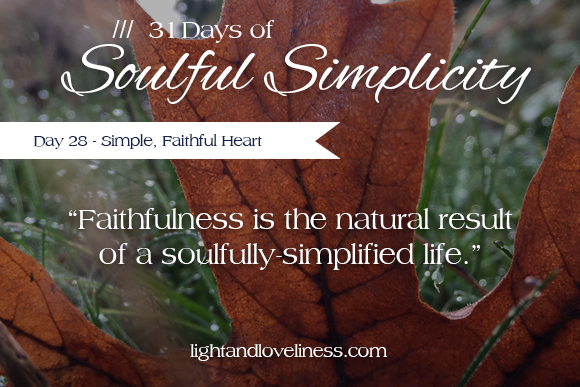 This is day 22 of Soulful Simplicity, a 31-day series through the month of October. The series can be found here, and I hope you find it enriching and encouraging. If you have any questions or would otherwise like to connect, feel free to send me a note: lightandloveliness [at] gmail [dot] com. P.S. If you’ve been following along in real time, you’ll notice I’m a few days behind. I am slowly-but-surely catching up! Thanks for your encouragement! Yesterday I shared about forgiving others as a way to finding freedom for yourself. Today, I want to talk about a little trickier aspect of forgiveness — the notion of forgiving yourself. I am assuming you have something from your past that you are not proud of. Maybe it’s small or maybe its big, but you have likely made a mistake at some point that still eats at you a little bit. Or maybe you can think of so many things you have failed at, your head is now spinning. In either case, I relate to you. I am a professional mistake-maker, and at one time in my life, I was also a perfectionist. That combo is a quick way to make yourself crazy. I have struggled to live with a light heart because I am one of those people who feels responsible for everything under the sun, even if I know it is not my responsibility. So if its not my outright mistakes, it is the constant pressure I feel to hold everything together with my own two (admittedly puny) little arms. For many years, I was never able to fully rest. I was always striving, always working harder to meet ever higher standards for myself, and never feeling like I could ever quite get there. I felt like I was sliding down a slope of negativity and self-loathing that felt impossible to dig out of. I also found myself spending an inordinate amount of time searching for love, affirmation, and any indication that I was “ok”—often times from people who couldn’t fill that need even if they wanted to…not in any lasting way. It is very easy to get buried under our mistakes, failures, personal limitations, and weaknesses. It is easy to think that if we can just work harder, do better, and maintain control of everything around us, maybe we can muscle through and find our way out of it. There are times to see what I am made of and stick with something that may be hard to do, but there is also a time to acknowledge that I just can’t. Or that I didn’t. And that I won’t be able to. And I have to make a decision to receive the grace that God gives and find my way out of the piles of failures and mistakes by way of surrender to God’s work in my life. It is good to be humbled. I have learned that humility an essential part of soulfully-simplicity. In humility, I find a lightness of heart because I acknowledge that I am human, that I have a need for God’s grace in my life. If I won’t surrender, receive grace, and learn how to accept my own weaknesses and limitations (acknowledging that God is not finished with His work in me), I can’t possibly live graciously with others either, and I also can’t dig myself out of the self-loathing hole. None of this really hit home for me until I realized I have children whose eyes are on me every day, and they are taking cues and taking notes on how to navigate life from what I say and what I don’t say. My children watch the way I talk about and treat myself. If I am never satisfied with my own efforts, and always dwelling on the ways I am not measuring up or not reaching my potential—they will internalize those same messages about themselves. It may not happen overnight as all of life is a journey, but if you pursue simplicity from this angle, from this place in your heart, you will find incredible, indescribable treasures in the arms of God, the first of which is being freed from the need to be good enough. He is good enough for all. 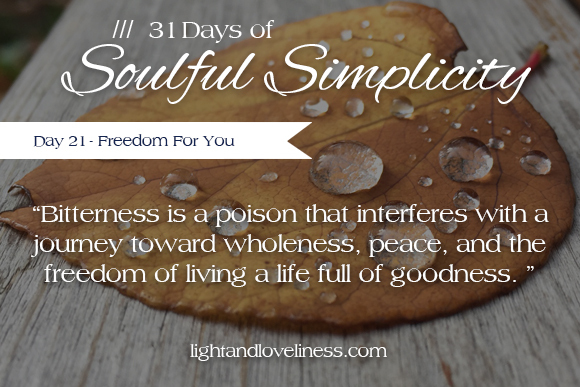 This is day 21 of Soulful Simplicity, a 31-day series through the month of October. The series can be found here, and I hope you find it enriching and encouraging. If you have any questions or would otherwise like to connect, feel free to send me a note: lightandloveliness [at] gmail [dot] com. Have you ever been hurt by someone in a way that remained painful for a long time afterward? My guess would be yes. Most people have a story of that sort they could tell if they wanted to. Today I want to talk about anger, and the what it does to us—not the person who hurt us—when we leave unchecked for too long. Anger is a strong emotion, and there are very real reasons to feel it. I don’t wish to minimize someone’s experience in any way, but I do want to call attention to what happens when anger gets a grip on our lives that we cannot shake. Anger left unattended becomes a dangerous vine with deep roots that are not easy to dig up. It has tentacles that slink around everything precious in our lives and distorts them, often keeping the things we want or need most out of our reach. I am referencing bitterness: what becomes of anger that has not been dealt with in a healthy way. The wounds we carry from others bring about a tricky paradox. We want need to protect ourselves from further harm, but also want need to move forward from a situation. Holding on to anger—which at some point turns into bitterness—absolutely stands in the way of simplicity and living whole-heartedly, which is why I bring it up. Bitterness is a poison that interferes with a journey toward wholeness, peace, and the freedom of living a life full of goodness. It takes up more space in your heart and mind than any other thing, and demands that you reject good things in life in order to nurture the bitterness. Most often, we feel justified for feeling bitter toward those who have wronged us, and the truth is, you may absolutely be justified…but that doesn’t mean that bitterness isn’t keeping you from things that you don’t realize you are missing. Forgiveness must happen if you want freedom for yourself. It has nothing to do with letting the other party off the hook and everything to do with freeing you from the grip that anger has on you. What I mean when I talk about or engage with forgiveness? Forgiveness means I acknowledge the deep pain that I feel, and I take action that will not allow my anger to keep wounding me in ever-increasing ways as it hangs around. Anger is like a worm that eats away a lettuce leaf. It damages more and more of the plant the longer it is allowed to stay there. Forgiveness is like plucking the worm off the plant and guarding against it’s return. It doesn’t change or dismiss the damage that was done, but it takes away the thing that would have otherwise continued to eat you up from the inside and make room for hope, healing, joy, and many other lovely things. Forgiveness is first for the person who is offering it. When you pluck the worm off of the lettuce leaf, you aren’t saying to the worm (or to the person who put the worm there), “What has been done to me is ok” or “I will just pretend that I was not hurt as deeply as I was.” You’re just saying, “This anger and bitterness does not belong here anymore,” and you fling that worm far away from you. What comes next? I would say, set healthy boundaries. Find the support you need to heal, which may include some combination of prayer, professional counseling, and the support of the community around you. Forgiveness really has very little to do with the other party, until/unless that party comes around hoping to restore relationship. They may never do that. If they do, you can choose where your boundaries lie and what you will engage. Forgiveness doesn’t mean a relationship is repaired, it only means that the anger toward the person who hurt you can no longer control you. It means there is potential to repair disconnection and broken trust, if both parties are working toward that. Forgiveness is the very thing that scoops up the terrible stuff on the inside of us, and sets it outside the door of our hearts. Does that mean we don’t feel the hurt anymore? Most likely we’ll still be feeling it, but acknowledging pain and carrying bitterness are two different things. Honestly acknowledging our pain and forgiving others are two ways of participating in our own healing process. It makes it possible for us able to move toward wholeness, having cut loose the cords that kept us enslaved to bitterness, opening us to God’s tender care in our inward-most places. 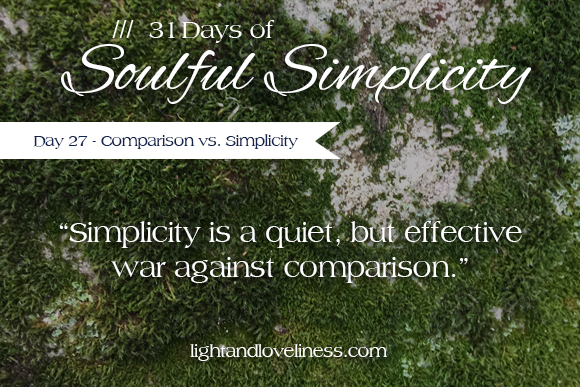 This is day 20 of Soulful Simplicity, a 31-day series through the month of October. The series can be found here, and I hope you find it enriching and encouraging. If you have any questions or would otherwise like to connect, feel free to send me a note: lightandloveliness [at] gmail [dot] com. P.S. If you’ve been following along in real time, you’ll notice I’m a few days behind. I will be catching up over the next few days. Thanks for your encouragement as I keep this slightly-crazy writing schedule during the 31 Days Challenge. I really would love to know if/how this series has helped you. When you become a mother, friendship is no longer just about hanging out. Friendship becomes a lifeline for mamas to keep hold of perspective that can be easily lost in the exhaustion, self-sacrifice, and relational disconnection that can come along with the season of caring for young children. Loneliness, discouragement, anxiety, and sleep deprivation are just a few of the things that can land on a mother’s plate in the early years, and solid friendships can make a huge difference in her resilience through those challenges. Friendship can help keep loneliness at bay, put reality in perspective, and provide a mama with the support she needs while navigating the trials of motherhood. The catch: Forming and maintaining friendships in the motherhood season poses new, unique challenges that can be a big struggle for many women. This has, at times, been a struggle for me—mostly because my desire to connect far outweighs my ability to make it happen the way I envision and as often as I’d like. I am very fortunate to have many incredible women in my life, and honestly, I have never been without a few solid friends to help me through, but I did notice a shift in the way I needed to approach friendship after my children arrived on the scene. No one ever tells you, “When your baby arrives, be prepared to encounter weirdly cavernous loneliness while simultaneously wondering if you will have any privacy or your own body-space to yourself ever again.” That’s not one of the things people talk about at baby showers or when they come to visit and bring you a meal, and yet, it is an experience I have heard countless women describe. The truth is, once you become a mother, you don’t have the same energy, time, resources, or ability to tend to friendships in the same way you once did. Even if you want to, you just can’t have the same social life you once enjoyed. It doesn’t mean that you will not have friends or fun ever again, but it does mean that it is most likely going to look different. On the flip side, meaningful friendships in this season are needed more acutely than ever before. For this reason, I think it is important to see friendship through the lens of simplicity—go back to the basics and figure out how to make it work for this new season of life. How does one navigate nurturing friendships in motherhood? 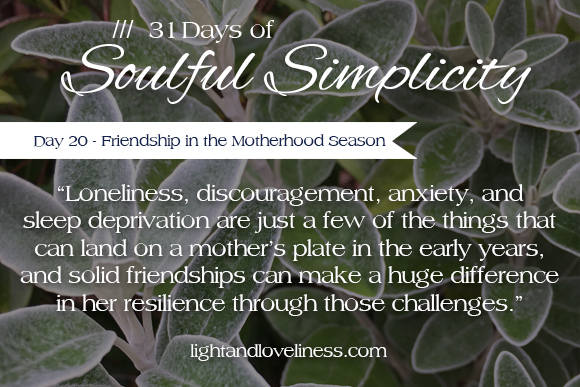 In my opinion, friendship in the motherhood season is about one thing: Grace. If you are able to have grace for yourself, and grace for the mamas in your life, you have the best shot at meaningful connection with them. I’m sure there are many more things that could be said, but I’ve put together a short list of things that may help you experience meaningful friendships in motherhood. Make peace with the mess (and the noise and the interruptions). Gone are the days of being able to have uninterrupted conversations for hours. If you’re hoping to get some real chatting in, you have to arrange care for your kids and go out without them. For me, this is not often a reasonable option, so I have perfected the art of tuning them out (while still keeping an eye on them) during phone conversations (something I still enjoy with far-away friends in spite of the newer texting culture), and employing a variety of techniques to keep the kids busy and out of trouble if someone happens to be visiting face-to-face, allowing me to carry on a sort-of-normal conversation. Understand that whatever time or attention another mama gives you is a precious gift. Caring for the needs of children is no small task, and if another mama makes the effort to connect with you, it means she cares about you, and cares about connecting enough to risk a toddler meltdown, or a messy house, and she is most likely putting off other important tasks that she could be doing in order to give you her attention…all things she is willing to risk for tending to a friendship. Vulnerability is a more effective way to make friends than being the ‘perfectly-put-together’ mom. I’ve never met a mom who doesn’t have at least a few deep insecurities about herself or her mothering, but I’ve also never seen meaningful relationships form without at least a bit of vulnerability. I would encourage moms who are longing for connection to be real about where they are at instead of feeling the need to be put together at all times. Hopefully the “me, too’s” from the other side of the table will strengthen your mom-friend connection. Quality beats quantity regarding time together or thoughtful gestures. It is easy for moms to begin feeling a little invisible in the early years of motherhood, but small things can go a long way to warm a friend’s heart. You might write a note of encouragement, surprise a friend with coffee or chocolate, or keep a favorite food on hand for when they visit your home. I have found that even a short visit with a friend every so often is better than no time together at all. Quality over quantity. The early years are an important time to actively seek out mom friends. When I had my first baby, I felt like it was nearly impossible to leave the house. It is a supreme challenge, I will say, but if you are able to connect with other moms who are learning the ropes as well, you will likely bond over the shared experience of motherhood in the trenches, celebrating your little ones’ milestones, and extremely sweet friendships can be forged in this time…sometimes lifetime friendships. Don’t wait to be invited. This one is a challenge for some, but I would contend that anyone is capable of extending an invitation. I promise you, there are moms in your town, in your neighborhood who are struggling with loneliness, disconnection, and the weight of many worries on her shoulders—just like you. Most are just waiting for someone to ask if they’d like to connect. Try to step into a hostess role wherever you meet other moms. I don’t mean that you need to be in full-hospitality mode, but take the risk to introduce yourself and ask a few good questions. At worst, they might not respond. At best, you may meet a friend that journeys with you and enriches your life for years. Worth the risk? I think yes. Show up—Yoga pants, no makeup, and all. It may take everything you’ve got to get out the door. You may look a mess, and you may have a fast-food meal in hand for sustenance upon arrival, but showing up is the single-most important thing you can do to grow your friendships in this season. There is never a time that an encouraging word isn’t appreciated. Moms are not often told what they are doing well. They may be appreciated by their husbands or their children, but it’s not always something that is verbally stated. Look for (and speak up about) what your mom-friends are doing well…sometimes these words are a lifeline out of unspoken discouragement. Look for the grace-filled mamas. Look for moms who do not judge you when you have a total mom-failure. Look for moms who will show up and invest in you as much as you will invest in them, and moms who will draw you out when needed, but also respect your boundaries. You don’t need drama, toxic behavior, or friendships that are not reciprocal in some way. Keep your mom circle open. If you have established in a tribe of mama-friends, try to stay open to new moms that may be looking for connection. It can be so easy to find a circle and figuratively close it to others without really meaning to. Keep an eye out for moms who may not have the same relational resources, and invite them to join you for a park date or mom meet-up. 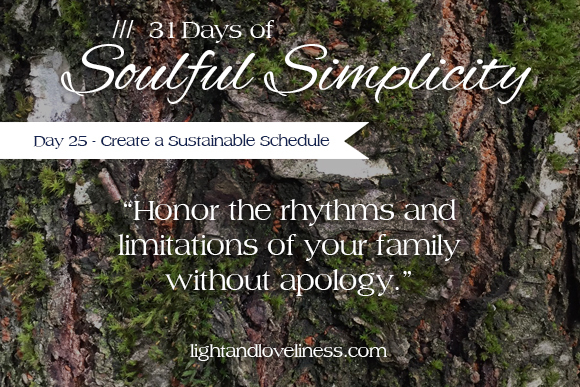 This is day 19 of Soulful Simplicity, a 31-day series through the month of October. The series can be found here, and I hope you find it enriching and encouraging. If you have any questions or would otherwise like to connect, feel free to send me a note: lightandloveliness [at] gmail [dot] com. The simplicity of a child’s heart is a thing of beauty. 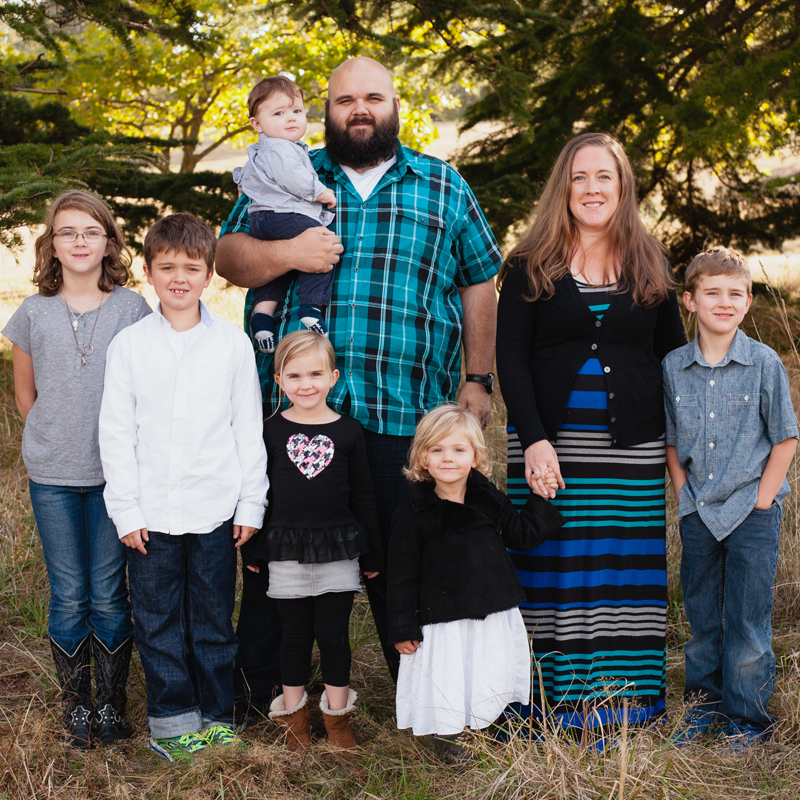 I am convinced God has given me six children so that I could discover—six times over—just how much joy, wonder, and beauty a single child can bring into the world. 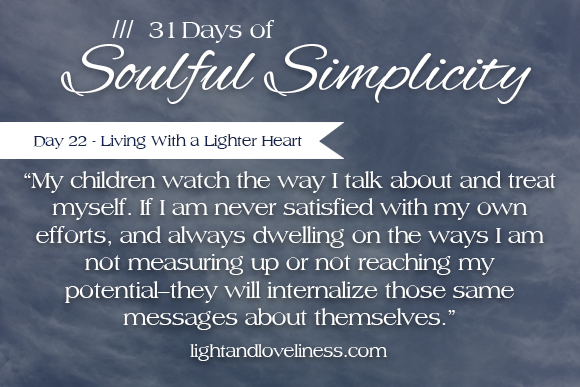 I have been on a mission to understand simplicity and live a soulfully simple life in part because I have learned that doing so helps me to see my children and their hearts with a new lens—one that I completely missed when I was caught up in the busy life. It is really easy to miss just how profound a child’s heart really is. Years ago, before I became a mother myself, I lived with a family for a summer during college. Husband, wife, daughter and son. The kids were young, maybe 1 and 3 years old at the time. They were sweet, funny kids who constantly did delightful things that made their mama light up and laugh loudly at different times throughout the day. When I think of her now, many years later, the image that comes to my mind is her great big smile and hearty laugh as her toddlers poured their joy into her through every means at their disposal, and I can’t help but long for my children to one day remember me that way. Do your children see you smile? Do they know that you delight in them? It is a struggle for me to put my adulthood on the shelf with all my worries and responsibilities and sit on the floor where my children play and join them in their world, even if its only for a little bit of time each day. Children are full of wonder, creativity, curiosity, and trust, and as I have re-discovered the beauty of childhood through my little ones, I have a swell of desire to hold space for this time they have to engage the world with wide eyes and open hearts. Mamas of little ones: Do you see your child’s heart? Are you able to see through the struggles, the tantrums, and the frustrations that come in the young years and see how brilliant and incredible your little person is? Delicate, but resilient. Tough, but tender. Stubborn, but teachable. Rowdy, but eager. And you have a front-row seat, with a front-row responsibility to guard and guide them to a life full of good things. There is no greater privilege or opportunity in the world than to influence the heart and mind of a child with love and diligent leadership, both of which require great personal sacrifice if they are to be effective. I hope you see the opportunity you have to fill them up with love, deposit wisdom into their hearts, teach and correct them with gentleness, build trust and security, establish connection and communication—all of these big things in these little years. If we don’t make the investment now, we are not going to magically have any of those things with them later, when they are up against bigger challenges with higher stakes. Little seeds grow up into big things. If our homes and our arms are not a soft place to fall a safe place to learn and grow and make mistakes, where else will they find that respite, connection, and peace? Not with us. For this reason, I take the pursuit of my children’s hearts incredibly seriously. Something that encourages me: perfection is not required to have a good relationship with a child, but it does take the daily intention to clear away whatever is unnecessary to make room for what is lovely and life-giving between my children and myself. This is soulful simplicity: parenting edition. My goal every day is to consider my child’s heart, not just their behavior. As such, the following things are the practical things I try to do when responding to them through all the challenges we run into. Get quiet, get close. I don’t know about you, but it takes a hot second for me to go from calm to boiling mad at some of the things my children do. My natural response is to yell. I hate that. A wise mama-friend I met a few years ago gave me some advice that I think about often. She said to me, “When your children are acting out, instead of raising your voice, make it quieter so they have to lean in and come close to hear you. Diffuse and disarm, instead of escalating situations with your own anger.” I have been hanging on those words ever since. It is not easy, but I can tell you, it is effective. Without flares of anger to cloud my judgement, I am able to make much more thoughtful and strategic parenting choices. Be attentive. Listen to your child share about what is on their mind and heart. You can love your children well by listening to them, and don’t be surprised what you learn from them. I do believe I have learned more from my children than I have learned anywhere else. It’s remarkable, really. Look for ways to nurture your connection. Tenderness goes a long way, even when you have to wear your parenting pants. You children need your leadership, but they need it with love and communication. The goal is to journey together—learning and growing in your respective roles—and that happens best when your relationship is built on tenderness and trust.